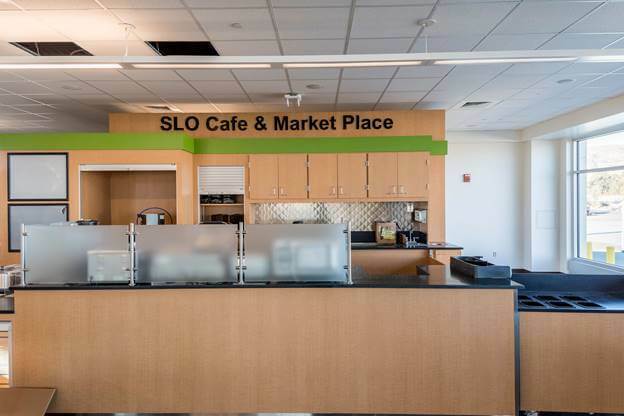 The Dining Options available are SLO Cafe & Market Place and Spirit of San Luis Restaurant . SLO Cafe & Market Place opens daily at 05:00 and is opened until the last departure flight. The cafe offers a variety of refreshments, breakfast and lunch entrees. That is located in the post-security zone of the terminal. Spirit of San Luis Restaurant offers a range of wines, sandwiches, burgers, starters, salads, desserts, and many more. The spot is opened from 07:00 until 20:00 Monday through Saturday, from 09:00 until 18:00 on Sundays, and from 09:00 until 15:00 on Sundays there is a brunch time. For the disabled passengers and guests of the airport, there are special amenities provided. The wheelchair assistance is provided by the airlines serving the airport when those passengers arrive at the airport. The service might be purchased in advance so that the airport agent would wait for the passenger at the gate. Curbside loading and unloading are available in front of the terminal near to the door two as well. Accessible parking spaces are provided at the Lot #4, which is equipped with the elevator next to the ADA parking spaces. Moreover, service animals are welcomed at the airport; thus, the pet relief area is available there as well. Notably, the particular restroom and family rooms are located throughout the terminal.